Our population is getting both older and sicker. One reason for the increasing incidence of poor health is the increasing weight on the average New Zealand adult. On an individual level excess body weight is a poor predictor of health. On a population level, people who have excess weight are more likely to develop long term health issues. So with this change in the population body weight adult New Zealanders are developing long term conditions such as diabetes, heart disease and kidney disease younger. Considerable time and money is spent promoting public health messages. Although many people believe healthy behavior is an individual responsibility, it is economically sensible to reduce harm through public health campaigns. The majority of public health campaigns focus on these areas of physical health. Be active at least with 30 minutes of moderate intensity activity daily. Eat plenty of vegetables and fruit, get your 5 servings daily. Mathematical models suggest that if everyone followed these recommendations, we would have a very healthy population, with far less chronic disease. At this high level there are only two messages associated with nutrition. Anyone who eats food will tell you that there are many more things suggested as important. So where do these other messages fit in? Many of the other messages are around factors have smaller influence on health outcomes than these big 4. Take for example reducing the amount of saturated fat into your diet to the recommended level of 10%. If you modify your fat intake it may reduce your risk of heart disease by ½, which is a relatively small margin. Whereas with smoking the risk of heart disease is 5 times that of a non-smoker. If you stop smoking, you reduce your risk by a big margin. It is simpler to understand if you try to explain it as a fraction of populations. If you had 1000 people who had a diet high in saturated fat, 20 to 40 of them will die from heart disease directly caused by their diet. Many people look at the risk of death associated with saturated fat intake and say they are willing to live with those odds and stick with the diet they like. What they miss is that heart disease deaths is only one factor influenced by the saturated fat. Other health consequences including disability and other conditions such as Type 2 diabetes are influenced by saturated fat intake. Many risk factors are cumulative, so high saturated fat and low vegetable intake magnifies risk. Other risk factors such as genetic history or childhood experiences are often unmodified by lifestyle change. When it comes to dietary advice, we are now on the edge of a revolution in thinking. 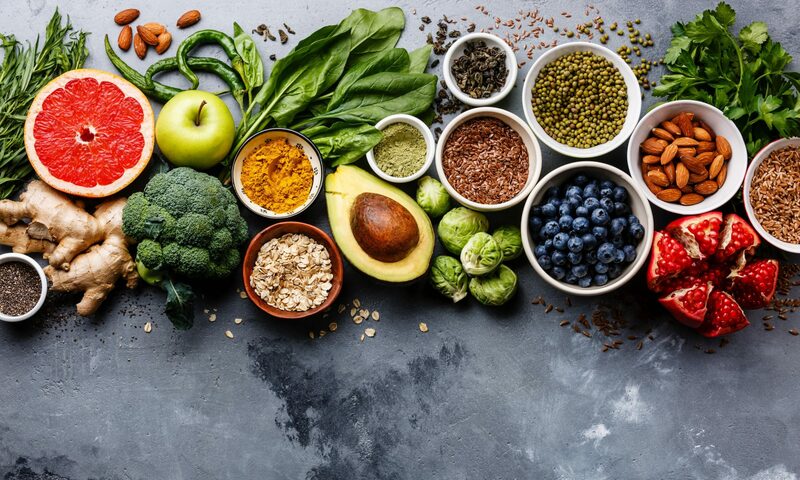 Dietary advice could be individualized based on genetic and epigenetic testing, giving the “best diet” for your genes. That holds some promise, but it fails to recognize one thing. We eat for many reasons. Food is not just nutrition, and the other reasons are why we need to get individualized advice. As a clinician my heart sinks if someone asks me for a diet sheet. I have never met someone who has stuck to one in 20 years of practice. Some people can make a good attempt, but others are completely unable to follow a prescribed diet and in that case we need to individualize the advice to take into account non-nutritional eating. Recently I had a lady who was eating broccoli. She HATED broccoli, but broccoli was a super food, so she was having it daily. I helped her see there were foods that were just as useful to her as broccoli that she liked. What was the difference between her eating broccoli and not? It was the advice of a dietitian. A dietitian is a registered health professional. They have to have a post-graduate qualification in dietetics after an appropriate undergraduate. To maintain registration they must demonstrate life long learning. Dietitians must abide by a code of practice and can be disciplined if there is a breach of ethics or a significant complaint. Dietetics is the interface between the science of nutrition and medicine. It involves modifying the diet to optimize well-being of individuals. The ultimate goal of dietetic intervention is either to prevent or manage health problems which have a dietary component. I supervise young Dietitians and love that part of my job. Initially young Dietitians will struggle because they have license to practice but don’t feel competent. In supervision I liken the experience to riding a bike. Initially you have to concentrate on the skills needed to ride a bike. After practice you become a skilled bike user. You can start enjoying the scenery and navigating complicated terrain. Dietetic practice starts with giving advice based on theory and develops over time as the practitioner becomes more skilled to include practical knowledge about how to make changes. Dietitians are trained in the science of nutrition. Their skill is to help the patients translate the science into a diet they can eat. A competent dietetic practitioner practices holistically. 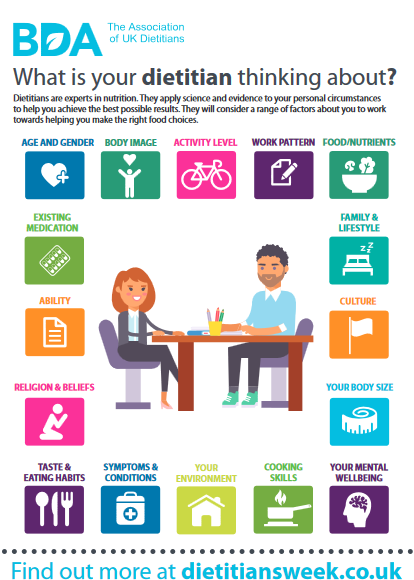 The British Dietetic Association poster I am using as the image on this article is my favorite representation of the complex process in my head when I talk food to someone. As we discuss their diet I am gathering knowledge, as we start discussing intervention I am looking for cues and clues that this intervention will work for them in their current life stage. Ultimately I would hope to form a relationship with them and they come back for further assistance as their life circumstances change. As of January 2019 I have started a major refresh of my blog. Lots of my blog will be about the science of nutrition. Some will be about the art of making the vegetable eating more possible. Other topic suggestions are welcome. With the pace of nutrition science I am not always going to be answering what you want…so please feel free to ask me questions or send me information you would like me to discuss.